Evaluating an MSSP is a key step in improving your organization’s cybersecurity posture. 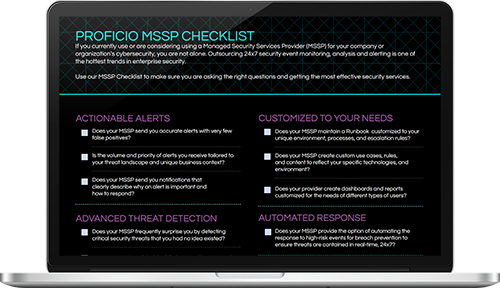 Use our free MSSP Evaluation Checklist to make sure you’re asking the right questions. At Proficio, we provide a full range of professional cybersecurity consulting services to help our clients improve their current security posture. From performing assessments and conducting penetration testing to determine the risk your organization faces to advising on incident response and forensics, our team is here to be your trusted cybersecurity consultant. Proficio has successfully undertaken security and risk assessments for many organizations. While the objectives of each customer engagement can vary, the focus is on examining the security posture of the organization’s critical technology platforms to ensure that all devices are properly configured and secured. As a key component of PCI DSS, HIPAA, and other industry standards, penetration testing attempts to gain access to the organization’s critical systems by exploiting discovered vulnerabilities. Proficio simulates the attack using the same tools and intensity to test and assess the effectiveness of the business and security controls. Our proven penetration testing methodology and process thoroughly identify security vulnerabilities. Organizations can have hundreds of in-house and externally developed applications. Proficio’s application assessment services address databases, web applications, source code and mobile apps and provide detailed reporting of application layer vulnerabilities, causes and remediation steps. Proficio’s Digital Forensics Investigation service gets to the bottom of how your systems were penetrated and what has been compromised. Our Incident Response experts perform a proper digital forensic investigation of your data storage devices, adhering to standards of evidence and legally admissible proof for criminal proceedings.